Thank you for your interest in Differential Amplifier with Active Headstage. Please complete and submit the form below and an ADInstruments representative will aim to get in touch within one working day. If you’d like to speak to someone immediately, office contact information is available from the contact page. An AC/DC single channel differential amplifier that is highly suited for extracellular recording using glass or metal microelectrodes. The DP-311 Differential Amplifier with Active Headstage is an AC/DC single channel differential amplifier that is highly suited for extracellular recording or weak EEG and EKG signals. 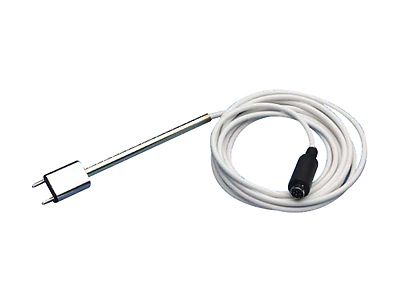 Its headstage can connect to either glass or metal microelectrodes via straight styled E Series Electrode Holders with Ag wire, which is purchased separately. 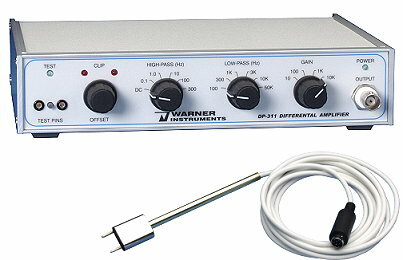 The Differential Amplifier with Active Headstage can also be purchased as part of the Extracellular Recording System. Excellent common mode rejection [120 dB @ 60 Hz]. High DC tolerance, high gain, low noise & bandwidth filtering. Small active headstage, which can be mounted in micromanipulators. 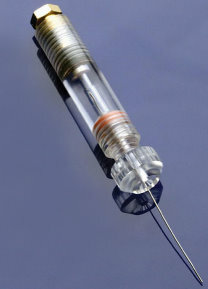 Suitable for use with high impedance glass or metal microelectrodes. High common mode rejection is very important in minimizing electrical interference. The high input resistance of the Differential Amplifier Series (1012 Ω typical) ensures that the instrument's high CMR will not be degraded by differences in source impedance at the input. This is important in extracellular recording, where the difference in resistance of the recording and indifferent electrode is often large. Extracellular action potentials are typically measured in microvolts but are usually accompanied by much larger DC electrode voltages. The Differential Amplifier is designed to amplify these microvolt level events with as much as ±2 V DC at the input. With gain selections at x10, x100, x1000 and x10000, even microvolt signals are sufficiently amplified for computer and recorder inputs. Noise is very low, typically 8 µV p-p at 1 Hz to 10 kHz bandwidth. Reducing the bandwidth with the low pass and high pass filters further lowers noise. An internal Cal signal provides a convenient check of amplifier gain and operation.